Synopsis: The sinister and provocative thriller from crime writing’s freshest new voice. Ethan Muller is struggling to establish his reputation as a dealer in the cut-throat world of contemporary art, when he stumbles onto a once-in-a-lifetime opportunity: in a decaying New York slum, an elderly tenant named Victor Cracke has disappeared, leaving behind a staggeringly large trove of original artwork. Nobody can say anything for certain about Cracke, except that he came and went in solitude for nearly forty years, his genius hidden and unacknowledged. All that is about to change. So what if, strictly speaking, the art doesn’t belong to Ethan? He can sell it—and he does just that, mounting a wildly successful show. Buyers clamor. Critics sing. Museums are interested, and Ethan’s photo looks great in The New York Times. Then things go to hell. Suddenly the police want to talk to him. It seems that Victor Cracke had a nasty past, and the drawings hanging in the Muller Gallery have begun to look a lot less like art and a lot more like evidence. Is Victor Cracke a genius? A murderer? Both? Is there a difference? Sucked into an investigation four decades cold, Ethan will uncover a secret legacy of shame and death, one that touches horrifyingly close to home. Kellerman’s tight, assured prose is electrifying, exhilarating, and compulsively readable. Part confessional, part philosophical inquiry, Stop is the detective novel reimagined like never before. Harlan Coben is one of the virtuosos of the modern thriller. Each new novel hits the top of bestseller lists across the world, and he has become the first author to sweep the Edgar, Shamus, and Anthony awards. Beginning with his acclaimed Myron Bolitar series (including the recent Promise Me), Coben soon branched out into stand-alone thrillers that have made his name as a master of clockwork suspense, including his latest, Hold Tight, which brings his trademark thrills into the most basic dilemmas of the modern suburban family. "In the beginning, I behaved badly." 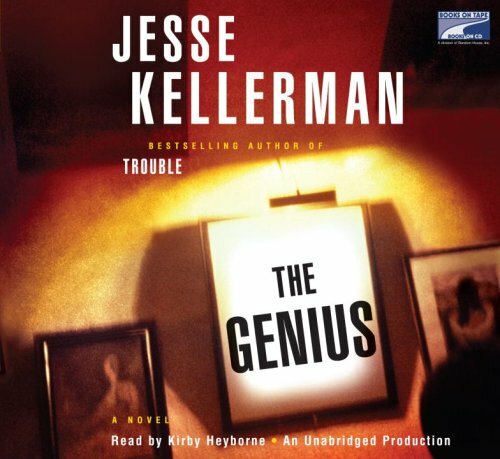 That’s how the uber-talented Jesse Kellerman opens up his newest novel, The Genius, and right away, he has you. I won’t give you a long plot summary because others will do it better, but briefly: A young art dealer named Ethan Muller manages to get hold of a treasure trove of original art after the artist, an unknown shut-in named Victor Cracke, disappears. The first sign of trouble crops up when a retired cop recognizes one of the figures as being a boy who died some 40 years earlier. Ethan's life spirals out of control from there. Before the story is over, Ethan will learn to question everything about his "wonderful" discovery--as well as his own family's destiny. Yes, the book is gripping and compelling and Ethan Muller, the narrator, is wonderfully wry company, but what truly separates Kellerman from the pack is his prose. Simply put, he is a wonderful writer. He has the ability to make everything seem, well, true. Every scene has that ring of authenticity that’s so elusive in fiction. I bought everything that Ethan did--and loved the flashbacks showing how the Muller family went from poor immigrants to real-estate tycoons. I love books where past crimes will not stay buried. The web of deceit in The Genius stretches back four decades, but it is still claiming victims. Jesse Kellerman tightens the noose slowly, and we his readers can do nothing but turn the pages. I have been a fan since his debut, Sunstroke, but he's getting better and better. If you've already read Jesse Kellerman, don't waste anymore time reading this review. If you haven't yet discovered his work, The Genius is the place to begin--and not a bad description of the author.